What happens when you both need to be pampered and could use a little self-care? A husband and wife are not always strong and resilient at the same time. But what happens when you both need a little “pick-me-up”? Well, do it together: unwind, dream, be decadent, create, indulge, relax, connect! Design the fun of self-care as a double blessing! 11 date night ideas that won’t need much moola. 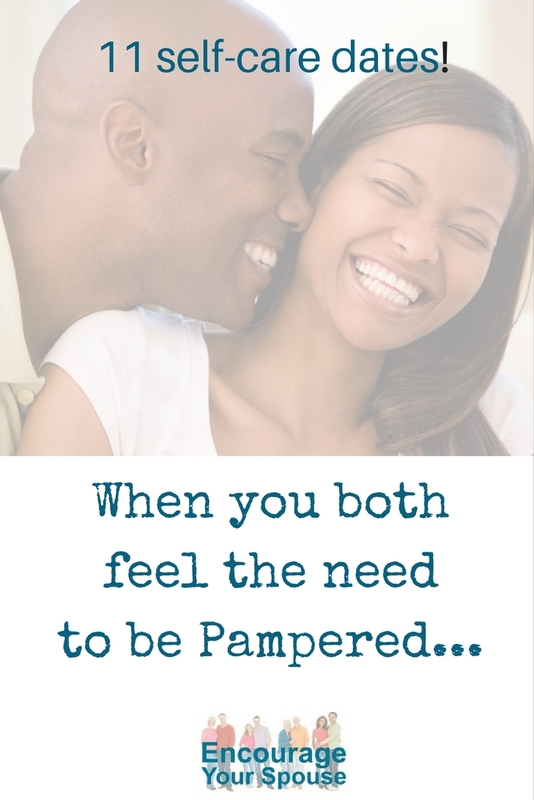 You both need to be pampered and that can happen at home or out! 1 – One word – two options: Bubbles. Have a bath together, and add some bubbles to soak away your cares. Or buy a few bottles of bubbles at the dollar store to “decorate” each other. Close the door to your bedroom after the kids are asleep and the less you wear, the more fun it is…. Create a YouTube playlist of the songs that were popular when you were dating. Have them playing on your computer or TV. Then dance together – fast and slow. The music and movement will cheer your souls and release all the tension. No need to sensor your moves – nobody is watching. 3 – If we had a million dollars… Dream. Give each other the “dream date” you’d have if money (and time) were not an issue. How? Collaborate to find photos online and print out a picture itinery of where you’d go, and what you’d do… It’s about dreaming as you relax at home. 4 – Words that make you smile… or blush. 5 – Close your eyes and listen. Unwind. 6 – Decorate a Cake. Decadence. And then eat it too! Make it. Bake it. Decorate it. And yes. Eat the whole thing. Feed each other bite after bite till it’s gone. Get creative with the frosting if you’re alone at home. Get Out! 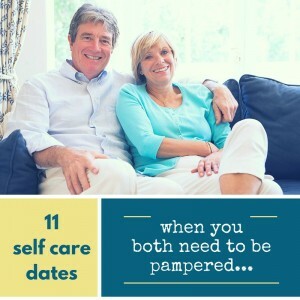 Self-care dates to get out of a rut. Outside your home. Without children. More inexpensive dates – but ones that’ll push you to get out of your comfort zone. A change can be as good as a rest when you both need a bit of self-care. 7 – Rhyme. Or not. Create. Go to the library for inspiration, then retreat to a coffee shop. Try your hand at writing a limerick to make each other giggle and gaffaw or bring each other to tears at the beauty of the haiku poems you craft. Commemorate your efforts by buying a frame and hanging your masterpieces on your bathroom wall. Visit a shop where they make chocolates by hand. There’ll be a spot closer than you’d imagine – google it! . Take a drive (even if it’s more than an hour – listen to favorite songs or a podcast as you drive) and when you get there, carefully look at every creation. Enjoy the smell of the shop. Anticipate which chocolate would be your spouse’s favorite and have him/her do the same. Are you right? Then buy two chocolates. One for her. One for him. Savor them. Slowly. Drive home. 9 – Get in hot water. Relax. Does your area have any natural hot springs? Do a bit of research – how far would you need to drive? If that’s not available, then inquire at your local YMCA, health club or even hotels in the area. Find a spot with a hot tub. Enjoy it together. 10 – Progressive dinner date. Feel special. Go to five different restaurants to make a full dinner and share each item. At the first share an appetizer. When seated at the second eatery, ask for two spoons and enjoy a cup of soup. Move to the third restaurant to munch on a salad – feed each other if you’re feelin’ it! Choose the fourth restaurant for something exotic: quail, or bison, or alligator. This doesn’t have to be too expensive. Choose your restaurants wisely, and have a little extra fun by deciding before you go that you can only have foods that begin with certain letters, or only found on trees, or foods that are a particular color. Your servers won’t know why you’re sniggering as you choose your items! 11 – Reach Out. Connect. Make a list of all the friends you haven’t seen in the last year. Go to a card store, and buy humorous cards to send to at least five people on your list. Head to a coffee shop and as you write out the cards, reminisce with your spouse about all the fun you enjoyed with each individual. Add a note to the card about what you remembered, and suggest getting together soon. Buy some stamps and mail those cards! 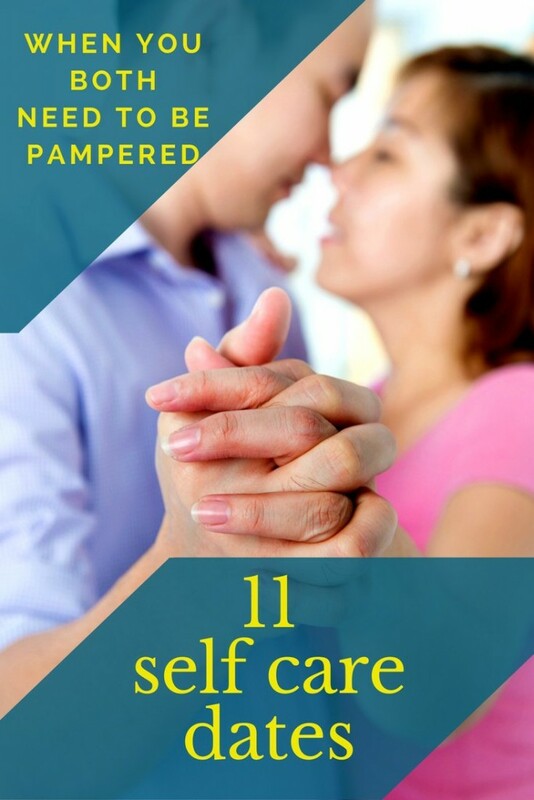 Pampering – do it together and double your self care. Be generous with each other. 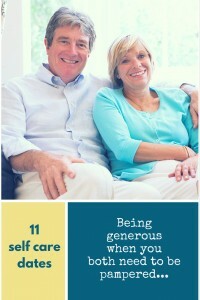 If you feel like you need to be pampered, then share with your spouse! Make it a habit to do kind things for each other. 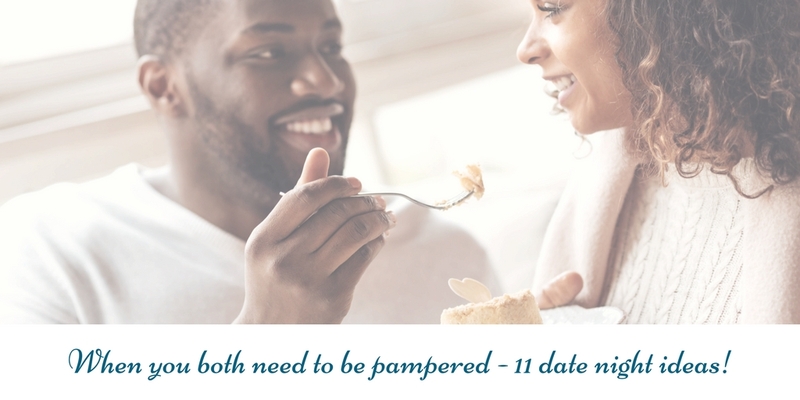 Date night is a perfect time to be pampered.